1. The Variable Analysis Game: Joel Bezaire presented The Variable Analysis Game: a simple game that encourages pattern seeking and algebraic thinking. The class is presented with three (or more) rows of numbers, with column headings labeled a, b, and c. Students must find the relationship between the numbers in the same row and develop an equation that uses all of the numbers in each column, and works for every row. I'll leave it to Joel to explain more and give some examples, found at variableanalysis.info. I plan on using this game in my classroom because it allows students to work at different speeds, communicate their reasoning without "giving it away", and has a natural extension. 2. 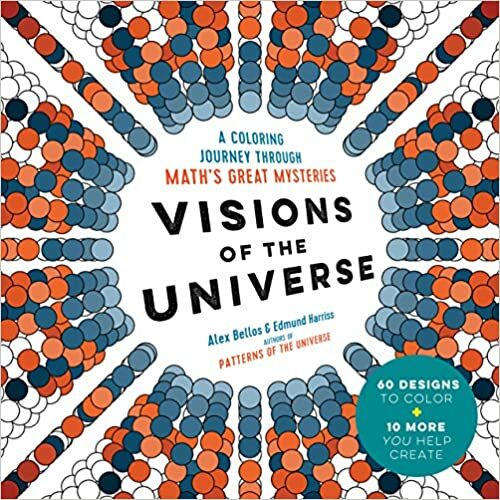 More Coloring Books: Edmund Harris (Current Prof at the University of Arkansas and my roommate for this TMC16) has released Visions of the Universe, a sequel to Patterns of the Universe. Both are adult coloring books steeped in mathematics. This iteration includes map projections, fractals, a representation of all the ways you can add to 11, and a number of lesson plans for bringing a bit of art into math class. 3. Nominations: Kathryn Belmonte encourages students to put more thought and effort into open ended assignments by nominating each other to share their work in front of the class. See the details here. 4. Birthday Functions: Hannah Mesick shares one of her favorite ways to celebrate her student's birthdays: by using them as an analogy to teach functions. Find more in her Prezi here. 5. The MTBoS is not a Plug and Play: Dylan Kane delivered a great keynote about moving beyond resources and into solid petagogy. His slides are here and the video is here (thanks to Glenn Waddell). 6. (Extra Credit) Using Photos: Sarah VanDerWerf uses images to remind herself of the little things she tends to forget while teaching. I'll try to find examples of these, but the internet is a big place.